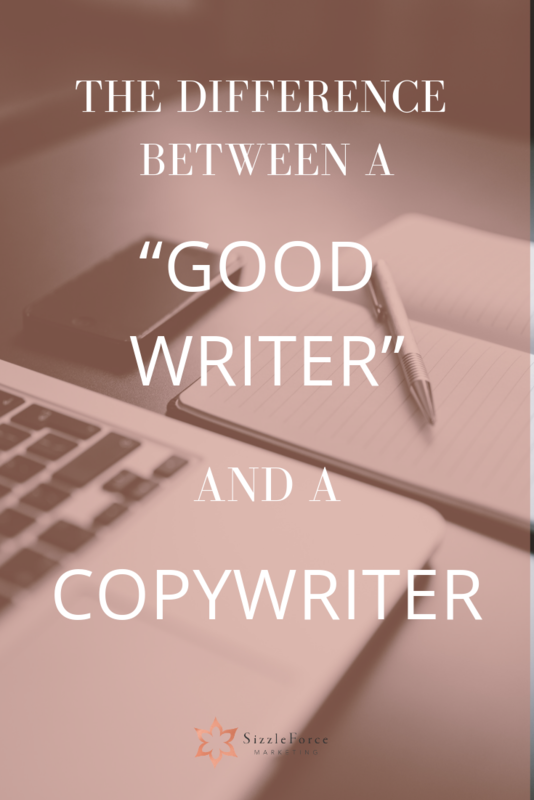 It can be difficult to understand the difference between a “good writer” and a copywriter. ‍♀️ …I have a degree in English! ‍♀️ …I’m a proud grammar, spelling and punctuation FREAK! Everyone in my circle knows I’m the “go-to” person when something needs to be edited. ‍♀️…I enjoy writing. It comes naturally to me. Can I get real with you today? There’s a big—no, a HUGE—difference between being a “good writer,” and being a copywriter. ✓ “Good writers” often write term papers, theses and dissertations that gain heaps of academic approval. ✓ “Good writers” often write riveting poetry and the love songs that make us cry ourselves silly. ✓ “Good writers” are often authors, screenwriters and playwrights. Sometimes, they even get paid for their work. “Good writers” usually write lots of good stuff. But there’s one thing they usually don’t know how to write: words that sell. And that’s exactly what copywriters do oh-so-well. ✏️ When you need a sales page written to promote your new course, you don’t need a “good writer”—you need a copywriter. ✏️ When you’ve invested tons of money and time into developing a new product that you’re launching and it’s time to get words on your packaging, you don’t need a “good writer”—you need a copywriter. ✏️ When you’re filming a video that’s supposed to sell your products and/or services, you don’t need a “good writer”—you need a copywriter. ✏️ When you’re trying to get butts in seats at the event you’re hosting, you don’t need a “good writer”—you need a copywriter. ✏️ When you’re developing a new website to promote your company, you don’t need a “good writer”—you need a copywriter. ✏️ When you’re sending emails to your list to generate excitement about your new “thing,” you don’t need a “good writer”—you need a copywriter. ✏️ When you’re spending gobs of money on Facebook ads, print ads, billboards, television ads, radio ads, etc., you don’t need a “good writer”—you need a copywriter. ✏️ When you’re on stage sharing a speech that you want to translate into sales, you don’t need a “good writer”—you need a copywriter. I could go on and on, but, you get the idea, right? Copywriters write words that make people take action. If you want words that make people think about things, a “good writer” may be all you need. If you want words that persuade people to go from “thinking” to “doing,” you don’t need a “good writer”—you need a copywriter. Here at SizzleForce Marketing, we write strategic copy that converts. We’re terrible poets (especially when it comes to Haiku’s). We can’t write a love song to save our lives. And we get into all kinds of trouble from the academics, because we (purposefully) break all of the rules we learned in 3rd grade English class. Because it makes an impact. (There. I did it again. My teachers always hated it when I started sentences with “because.” And those one word sentences I loved to write then (and absolutely adore now) are still the bane of Mrs. T’s existence. Need help ticking off the Mrs. T’s of the world so you can SELL MORE STUFF? Talk to us. We’ve got you.